The golf course is closed for the winter, but we are NOW ACCEPTING ADVANCE TEE TIME RESERVATIONS for 2019. Targeted opening date is May 10th. Green fees include use of the practice facility. Power cart rental with GPS is optional, $45/cart. 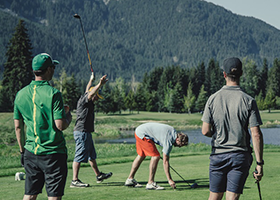 Special ongoing and annual events at Nicklaus North: click here for info! Complimentary with round of golf. $30 for practice session. 48 hours. Cancellations inside of 48 hours, or no-shows, are subject to the full charge to credit card on file. All prices are in Canadian Funds, and are subject to applicable taxes. *Opening and closing dates are subject to weather conditions and may change.